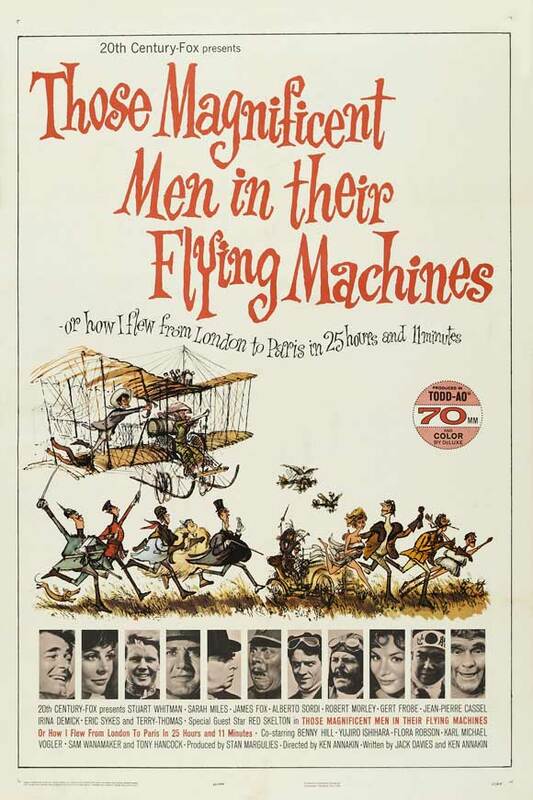 Those Magnificent Men in their Flying Machines (Or How I Flew from London to Paris in 25 hours 11 Minutes). 20th Century Fox 1965. I came home for Thanksgiving, and found this movie on loan to my parents from my grandparents. I know nothing about it other than what the box says, which isn’t much. I know it’s a comedy, and that Terry-Thomas has some small, lead-dwarfing cameo in it. It’s about the early days of flying in the second decade of the 20th century, and the first air race. The box says nothing about the plot, but I would guess that it has loads of characters, much like It’s a Mad, Mad, Mad, Mad World. Richard Mays is a military man and amateur aeronaut courting Patricia Rawnsley, the young tomboy daughter of Lord Rawnsley. He suggests to Rawnsley, a newspaper owner, that the Air is the next frontier that England needs to take dominance in. Rawnsley decides to sponsor an international air race from London to Paris, with the expectation that Mays will win and then marry his daughter. However, among the foreigners who come to participate is an American from the Western frontier who takes a liking to Patricia, and unlike Richard, Orville will take her flying against her father’s wishes. The ensuing love triangle suddenly starts showing the audience all the reasons why Richard isn’t the right man for Patricia. Meanwhile, the French and German teams have a prank war, the Italian entrant never flies the same plane twice, and Terry-Thomas’s character tries to cheat all of the other competitors out of the race. He’s actually almost important enough to justify his place of honor on the poster. A lot of the humor of this movie comes from the subplots with the other contestants, leaving the love triangle, if not serious, then much more reserved. The unfortunate thing about that story is that until Orville enters Patricia’s life, there is nothing to suggest that Richard is anything less than the man she deserves. Thus, I at first side with him when Orville starts making advances. When Richard starts becoming ungentlemanly, he starts to lose me, but it’s too late. The only positive aspect of the way this is handled is perhaps that it kept me unsure as to who would win until nearly the intermission. Oh yes, this film has an intermission. Much like many other films of the time, this one has a distinctly colorful focus on beautiful vistas and a story long enough to justify an intermission. (Though somehow, in these hurried days we can still sit through two and a half hours of story without an intermission while they couldn’t then.) The intermission divides the film between the arrival and practice runs of the competitors and the actual running of the race itself. Very little of what goes on in the second half is relevant to the story, and is mostly about showing off European countryside and doing visual jokes. Which is to say, fun but frustrating. This was not as much an ensemble film as Mad Mad Mad Mad, but I liked it better for that. I would have liked to see more interaction between the subplots and the main plot, but this way is less confusing than a broader piece like what I expected. Watch this movie: prepared to have unanswered questions. Don’t watch this movie: feeling compelled to keep notes.